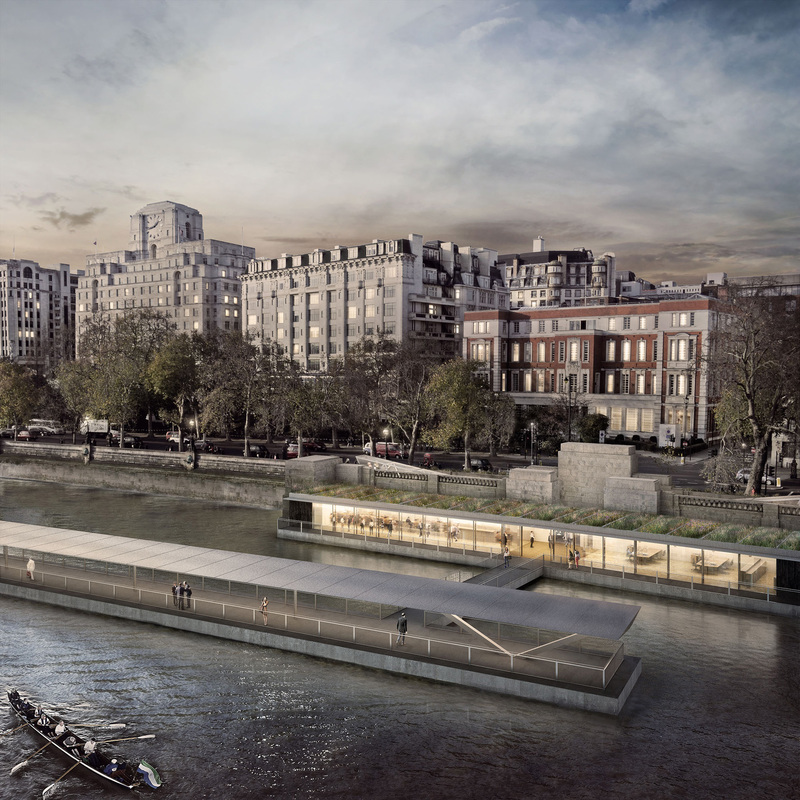 The scheme, which forms part of a Scheduled Monument on the Victoria Embankment between Cleopatra’s Needle and Waterloo Bridge, has been designed to be sympathetic to the surrounding historic fabric as well as to the river environment. The Passive House waiting room, reception, bar and ancillary staff accommodation is a floating structure and has been designed to fit discreetly under a single roof in a historic recess of the Scheduled Monument, with floating ramps to the street behind. The low, cantilevered roof will provide a natural brackish riverbank ecology. English Heritage described our proposals as ‘streamlined and elegant’. The overall effect will be of a restrained Nordic quality. The design palette consists of natural and durable materials: finely-detailed, slim sections of stainless steel structure, charred timber cladding, textured and waxed timber internally for visual warmth, and rugged clay brick paviors underfoot. The 150m long berthing pontoon is very prominently located, extending in front of Cleopatra’s Needle. It was granted planning consent on condition of extremely high-quality detailing comparable with our public space projects for the City of London, which are also located on or next to some of London’s finest Historic Monuments. We worked closely with the Environment Agency and it was at our insistence from the start that no effluent will be allowed to be discharged into the Thames, which was allowed until 2015. Our involvement with the project ceased shortly after the EU referendum in June 2016.